I hate advertisements. It is kind of a spam for me either is coming from a newspaper, flyer, radio, TV, Internet portal etc. However, they pay the different TV channels, radio stations and some news portals. 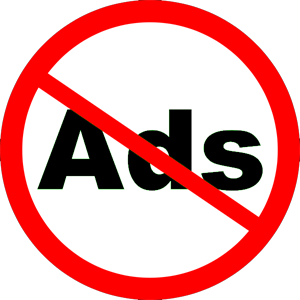 Whenever I could I avoid even reading/looking/listening those advertisements, and of course clicking on stupid links is strictly prohibited. Remark: Once I discussed with a friend working with Yahoo France and I told him about my policy concerning the advertisements. He smiled and assured me, their business is not targeting such persons like me, but rather naive surfers who will click. You can imagine such a portal having several millions hits/day will attract some several thousand of clicks ... I belong to that 0,001% who does not click on the advertisement links. Anyhow, I am quite proud that all these "modern" selling schemes/tricks fail miserably with me! However, recently I started to listen some radio station here in Washington (I will not disclose the name of the station is order not to advertise it!) and even though the advertisement is really rare, in those few minutes when they do advertisement they really do it. If you are stupid enough you will end up with a new credit to reshape your kitchen, a new matrace for better sleep or the best cell phone ever to send instant messages over the ocean. They are good, damn good, I have to tell you! They rely on your feelings and they present everything in such manner that your are ready to jump and go for it. I have spent time in different countries but here in US I think they achieved the highest standards. Those sentences, those words, that music. Just simply incredible! Anyhow, they still fail miserably with me and my policy is and remains: "buy the product you need and not the product which some company wants you to have". Elegem van onokbol magyar "politikai elit"